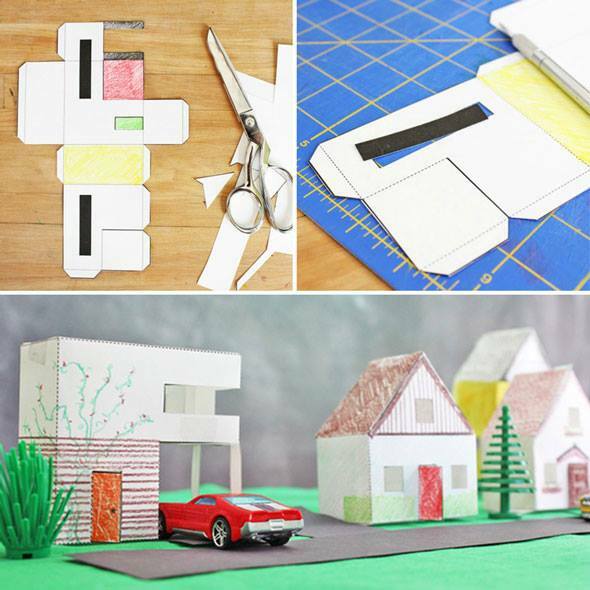 Being that I am an architect, making Paper Houses has topped my must-make list for some time! 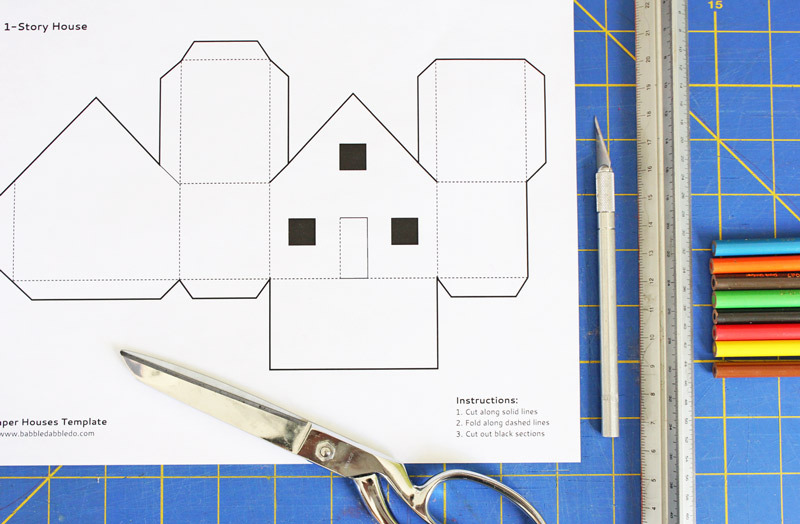 Today’s tutorial is for 3-D paper model houses and I’ve got 3 templates for you to choose from, including a modern version. 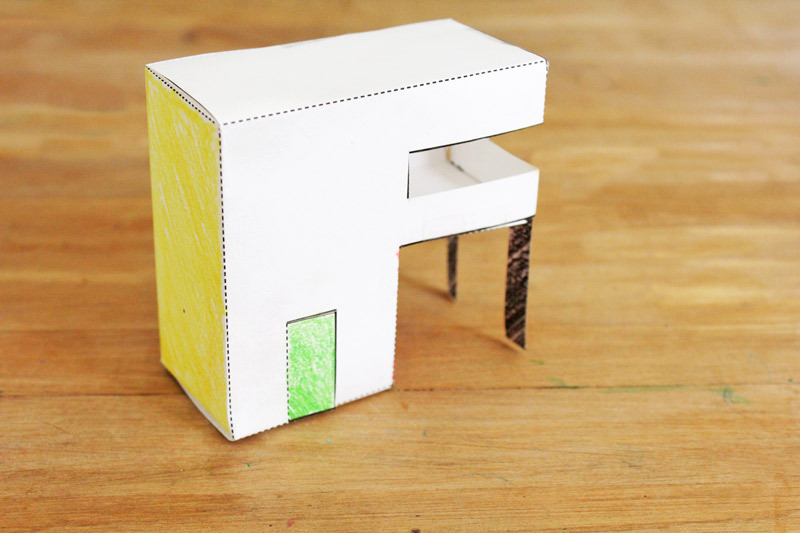 You didn’t think this modernist at heart would forget a Le Corbusier style model did you? In architectural and art school I LOVED making models. In fact you could call me a bit of a model nut. I’m not so good with sketching but give me an X-Acto and some chipboard and let the fun begin! Today’s project involves a lot of cutting and folding and is perfect for school aged kids. If you have a little one, they can decorate the house and then have an adult assist them with the cutting, folding and taping. Note: This post contains affiliate links to products I recommend to my readers. Card Stock– This is THE BEST DEAL on it! Tip: I suggest making a plain sample model first so kids can understand what each surface is (floor, roof, wall, etc) and having that to reference while they decorate their house. 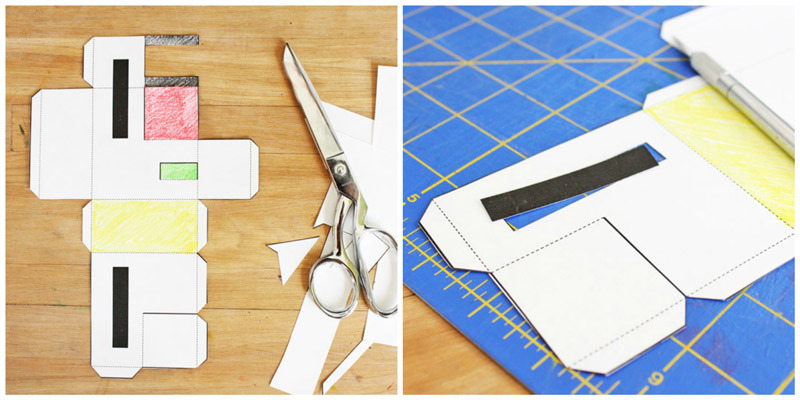 Step One Download and print out your templates on card stock. Step Two Decorate the house while the template is uncut and flat. Step Four Adults can cut out the solid black areas with an Exacto knife. Step Six Tape or glue the tabs to the model. I suggest taping for a quick build! You’re done! 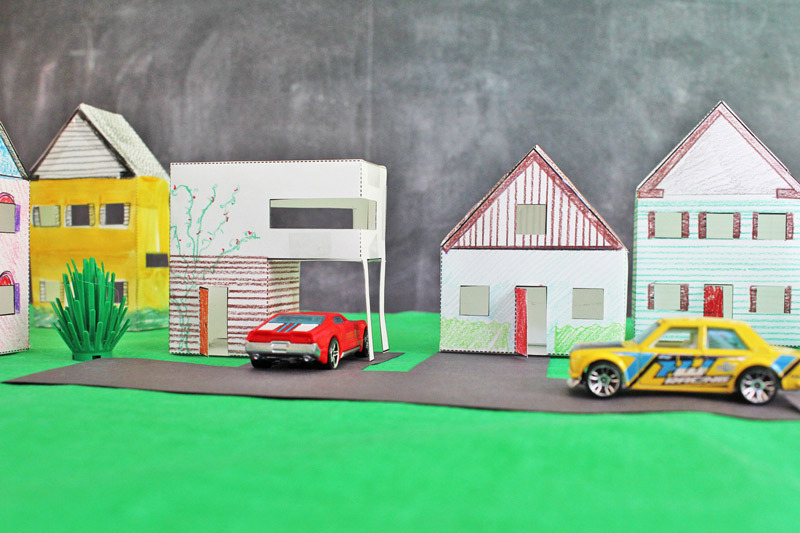 Make a whole bunch of these for a sweet little paper neighborhood! Le Corbusier. 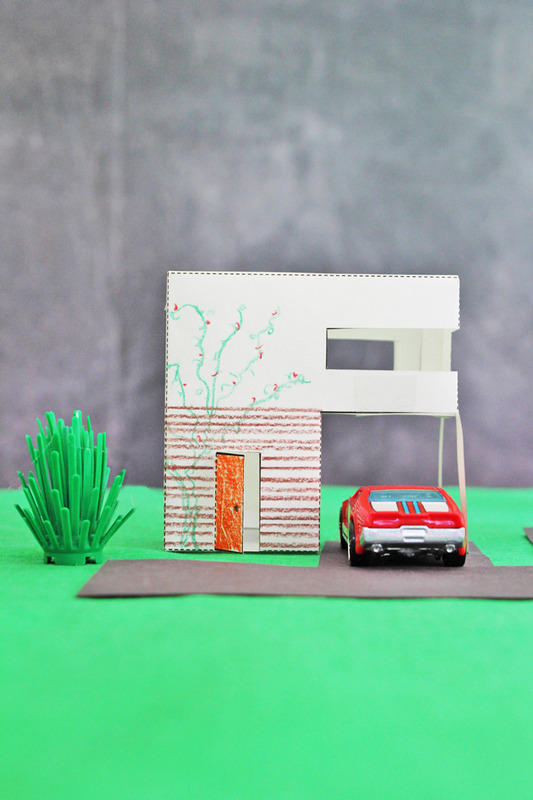 The third “modern” paper house is all about the father of modernism, Le Corbusier. A handful of projects stood out to me in all those architectural history classes I took in college and none more than the Villa Savoye. Most people might look at the house and think “Okay, what’s the big whup?” but can I tell you, it was built in 1930! Yes, 1930! If it was built in 1980 we might not have blinked an eye but he built this 50 years before that! Does the phrase way ahead of his time come to mind? Despite my feminist concerns about Corbu’s belief in the modulor, a system of scaling based on a 6-foot man, I still find Le Corbusier’s work inspiring. His deceivingly simple plays of shape and form never get old to look at when I’m searching for an architectural pick-me-up. I hope you’ll add a little modern house to your village! I love it when you guys share images of your students or children working on projects from our blog! 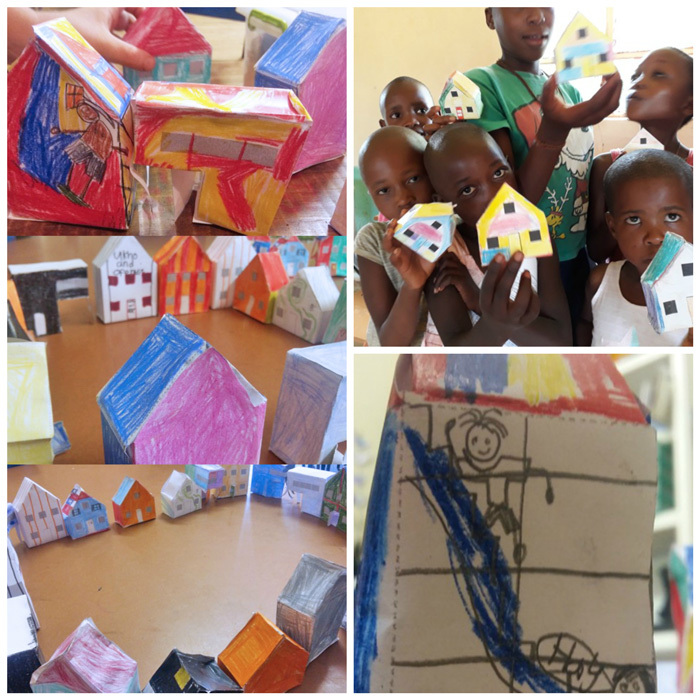 These images are from reader Marion who works with kids in South Africa and Lesotho. If you ever have images you’d like to share email them to ana@babbledabbledo.com. 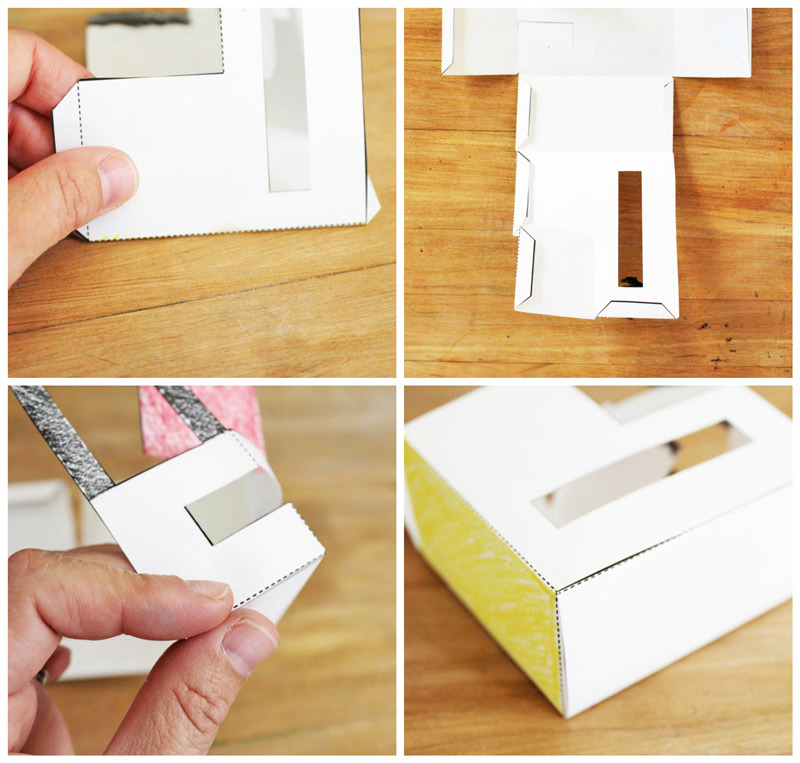 Did you like building with paper? 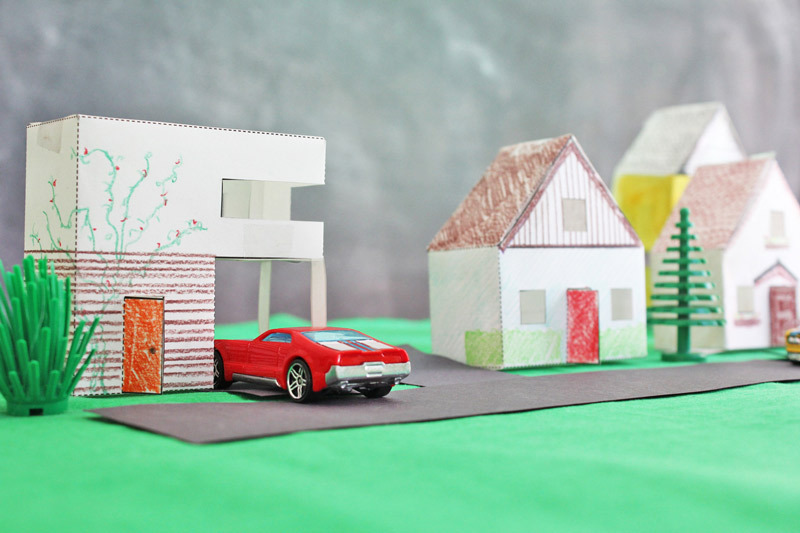 3D paper crafts are a favorite of ours too! 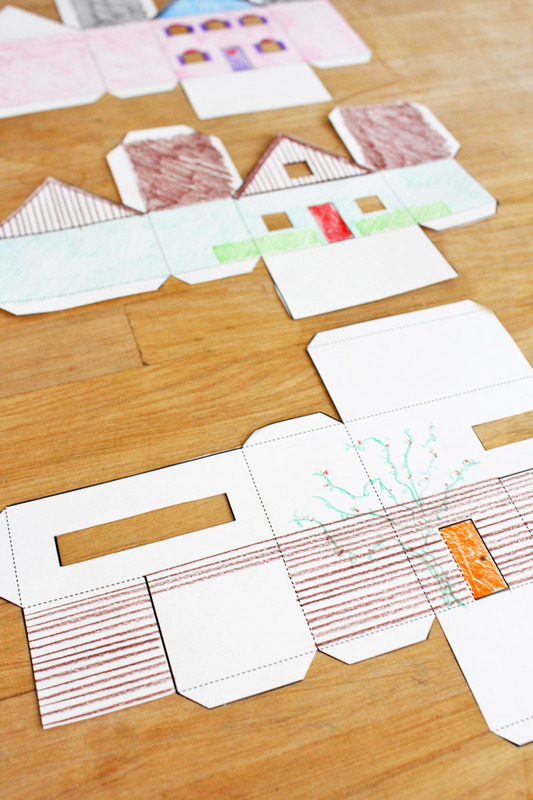 And what I loved most about making paper houses was the blank canvas you can hand to kids and ask them to personalize. Thank you for sharing! My husband is extremely crafty with paper, and he created the whole Christmas village out of paper complete with a skating rink and a carousel with LED lights, but his are very involved. Perhaps I can get our 7 year old interested in trying out yours! Thanks Natalie! I’d love to see pics of the village! Post them to BDD’s FB page if you have a chance! This is one of the best projects of yours! My kiddos love doing it when we are studying perimeter and area. They are put into groups and make a 3-D neighborhood. This year they went above and beyond. Thank you so much for sharing! glad to have found your site! amazing stuff! Jeanine recently posted…One Link Friday? Thanks Jeanine! I so happy you popped over! Your site is really helpful!! I’m trained in architecture and in three weeks I will be a guest speaker in our local elementary school, speaking about what is an architect. 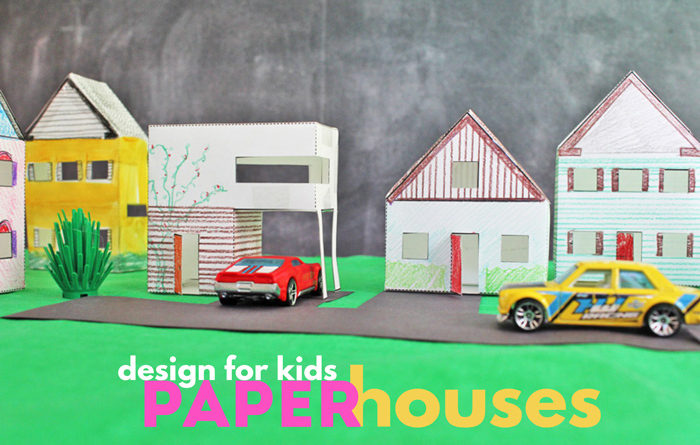 Hopefully I can make a little project for kids with this paper houses. Thanks a lot!! It was really helpful my teacher appreciated me. THANK YOU SO MUCH. My 4th graders did these in groups as a wrap up to our perimeter and area lessons. They built them onto poster board and created their own neighborhoods! 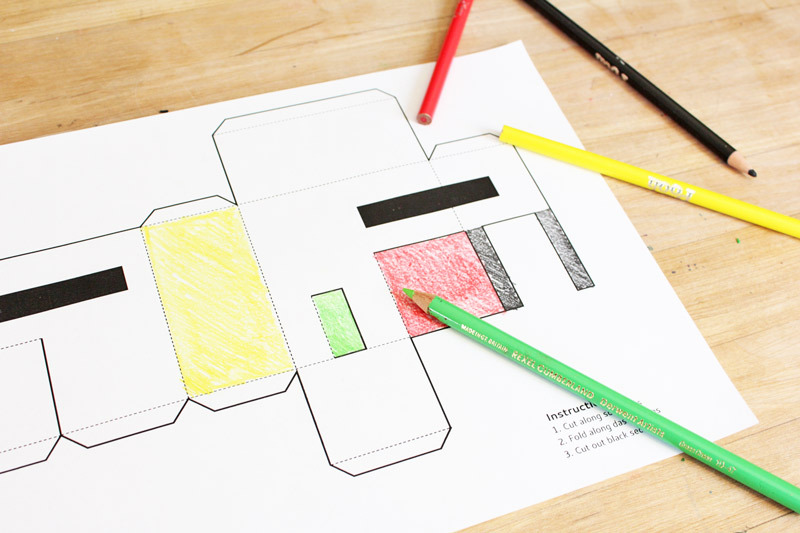 Labeling each with perimeter and area…turned out awesome!! Thank you sooooooo much for sharing your hard work and making mine that much easier! Awesome!!! I would love to see a picture if you have one!!! These were a big hit. We used a credit card & knitting needle to score the fold lines on the back of the tabs. Went together perfectly. We had a whole village. We used the outline without the Windows to make store fronts. Kids can be so creative.